SSC/Dakhil and Vocational exam result 2015 is going to be published in the last week of May. This time all together 1479266 candidates had participated in SSC exam. But many candidates may not be happy with their result. For them Bangladesh education board always gives the opportunity to recheck the exam. The total 87.04 percent applicants have passed the SSC, Dakhil and SSC Vocational examinations in 2015. This year, 111,901 examinees secured GPA-5. SSC Result Re-scrutiny Application will be start from 31st May and it will be continue on 6th June 2015. Every year a number of students go for recheck or re-scrutiny which is commonly known as ‘Board Challenge’ and ‘Khata Challenge’. The complete details of SSC/Dakhil/Vocational re scrutiny application process has been provided here. Students can have a look for their own betterment. SSC Re scrutiny Application Procedure 2015. SSC, Vocational and Dakhil rescrutiny process can be completed by SMS format. The complete SMS format has been provided here. 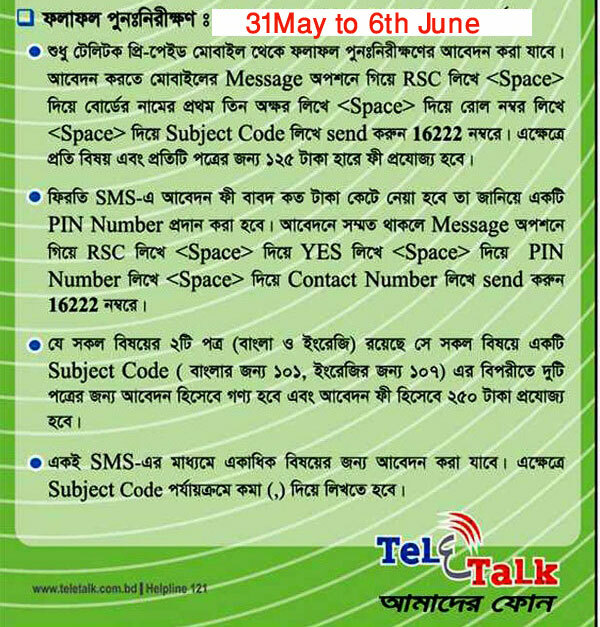 Bangladesh education board will send a message to your number and PIN no will be provided there. Application charge details will also be given in the SMS. As per as our concern, the fee was 125 taka. If you are interested to check your subject result then send the second SMS. Type RSC<space>YES<space>PIN number<space>Contact Number and send it to 16222. If you want to check more than one subject result then use comma to separate the subject code. Check your contact number whether it is correct or not as all information will be provided in that number. SSC, Dakhil and Vocational re scrutiny process will be held just after the publication of SSC exam result 2015. Generally, SSC rescrutiny result is published separately in different boards. So search for your related board re scrutiny result. Interested candidates should be search for following board result. How to Challenge My SSC Exam Result with Board Result? After publishing the SSC/ Dakhil or Vocational result 2015, students who will be doubtful with their result can apply to re-scrutiny their result. To apply for re-scrutiny individuals must have to use teletalk sim. The board will be published the date for re-scrutiny. So between the deadline, students will apply for their re-scrutiny and the further details are given here. Here is the process to apply for re-scrutiny. SSC board challenge application process 2015. Get SSC Result Re Scrutiny Application Process With Recheck SSC Result 2015. SSC Re Check Result published soon.